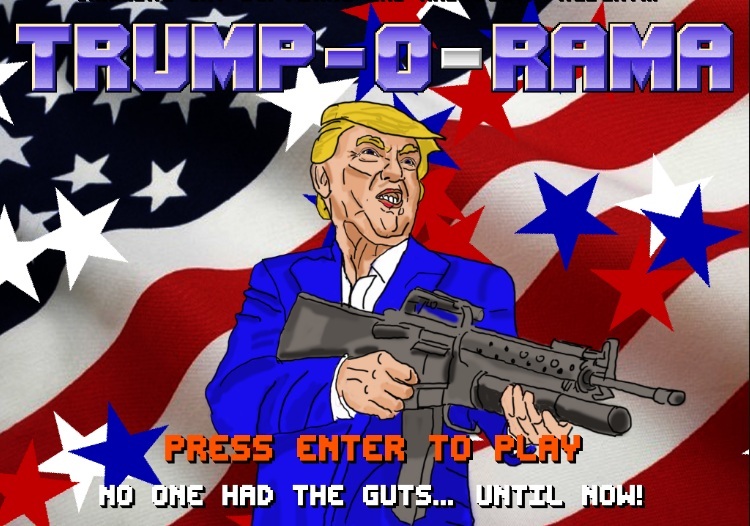 Trump-O-Rama is a sidescroller shooter where yes, your character is Donald Trump, the man who could be the next US President. The objective of the game is simple: armed with your assault rifle, you rid the country of the people Trump “loves” the most, by blasting them to pieces of course. This is a satirical game that’s as much fun to play for the action as for the jokes. Gameplay is simple enough: use the arrow keys to move around the Z key to fire your rifle, and when you get your hands on the rocket launcher, hit the X key. However it’s not going to be easy as the immigrants and terrorists are armed as well, and you need to steer clear of the suicide bombers because if they go off so will you. Aside from blowing up the immigrants and other “undesirables” to make “America great again”, you’ll also need to save beauty queens and bankers, and you need to get hold of Mexican immigrants to build the great wall. The better you play, the higher your approval rating will be and you’ll get the chance to use drones or get help from Trump supporters. And make sure to look out for Sara Palin as she can help you in your campaign. The humor is everywhere: at the end of each level you’ll be greeted by one of Trump’s infamous quotes, and when it’s game over you’ll hear someone say “you’re fired”, in reference to Trump’s reality TV show. There are a lot of jokes here, from the billboards you pass by to the various elements in each level. All in all, Trump-O-Rama (or as some would call it Drumpf-O-Rama) is a funny, engaging and thought provoking game.